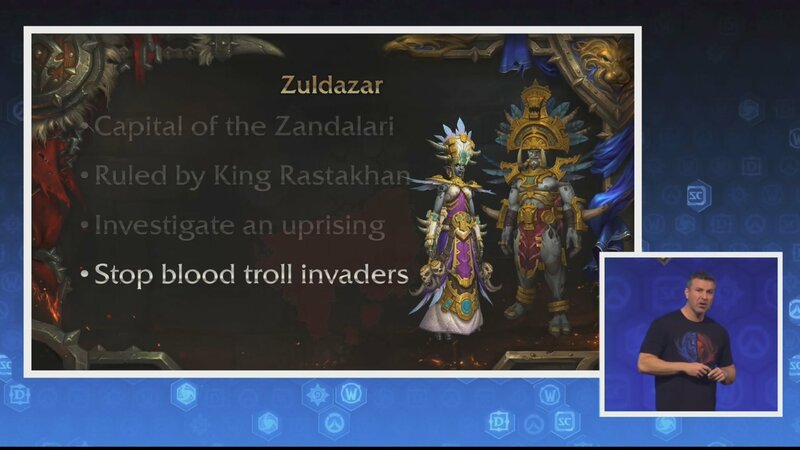 Alex: Without a doubt, Troll civilizations are some of the oldest on Azeroth, and the Zandalari empire is no exception having being formed some 16,000 years ago. 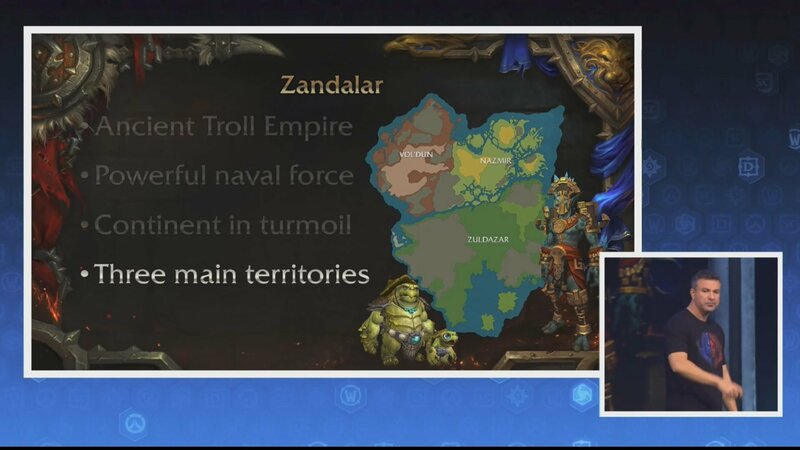 Now the island we know as Zandalar today was actually once a land-locked mountain range; but the Sundering changed all of that when the mountains and most of the empire sank into the sea. The trolls are a hardy and resourceful race. They adapted to island life. Over thousands of years mastered the seas. Today, the Zandalari have a navy that rivals (if not surpasses) the Kul’Tiran’s — which makes them a very attractive ally to the Horde and this Battle for Azeroth. But when we arrive there, we will find that things are not going great for the Zandalari; and before we can get them to join us, we are going to need to restore some order. 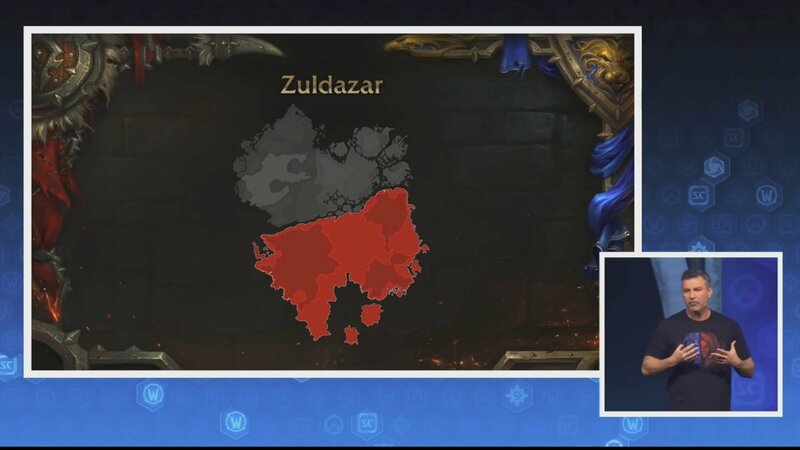 Like Kul’Tiras, Zandalar is broken up into three main regions: We have got Zuldazar in the south. The swamp of Nazmir in the northeast, and the desert of Vol’dun in the northwest. 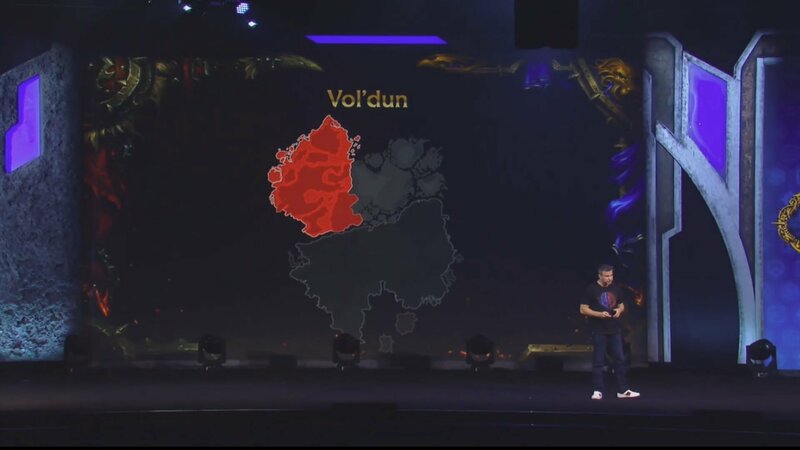 Let’s take a look at the zones of Zandalar. Starting with Zuldazar itself. Zuldazar is the capital city of the Zandalari, and also the only safe refuge the Zandalari trolls have in this region. They are being attacked not just from outside their borders, but from within. This will also be the capital of the Horde in this expansion, as they try to keep this empire from falling apart. Now, when we first arrive at Zuldazar, we will meet King Rastakhan and his daughter, the mighty Princess Talangi(?) — and with Talangi, we will explore and investigate a potential uprising within capital city; and if that weren’t bad enough, blood troll invaders from the north (from the swamps of Nazmir) are hammering the borders of Zuldazar making things really hard for the Zandalari. Let’s take a look at a video of Zuldazar. Epic. Videos are nice, but they don’t even do the actual zone justice. Once you get in there, it is amazing. On to one of my favorite zones: Nazmir. 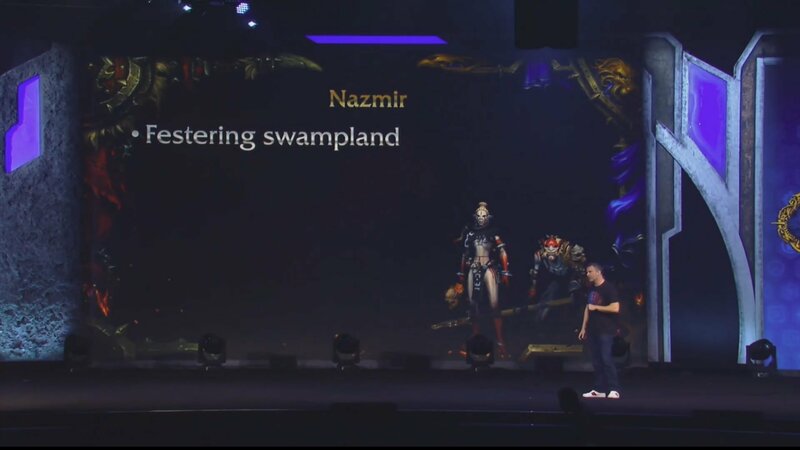 Now, before the Cataclysm, Nazmir was a lush forest, but when Deathwing broke the world, he shook something loose; and Nazmir started sinking into the sea. Today, it is a wretched festering swamp, which turns out is the perfect environment for Blood Trolls to thrive in. The same Blood Trolls attacking Zuldazar today. Now, to defeat these Blood trolls, we are going to need to enlist the aid of powerful Loa; and for those of you that don’t know, Loa are basically gods to the trolls. Up there we have got Bwonsamdi (who some of you may know), and Croak’ua(?) — a frog Loa who you definitely would want to know if you want that sweet frog mount. I know you do. I know you do. Now as we dig through the muck, in Nazmir, we will uncover ancient Titan secrets, and the Titan facility; and inside that facility they might hold the key to destroying all life on Azeroth — which clearly we do not want; and I hope the Alliance is paying attention here. There are things you are going to need to do as well; and you know what’s awesome? 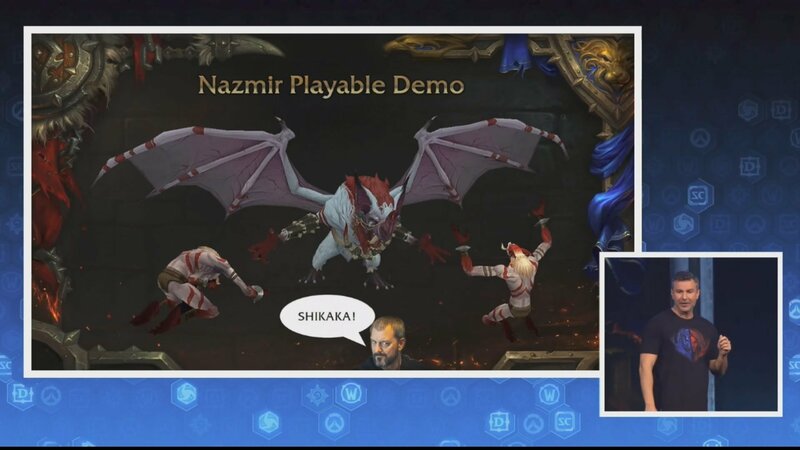 Nazmir is playable today on the showfloor. So– How did that get in there? Chris Metzen? Good lord. So let’s take a look a video of Nazmir. 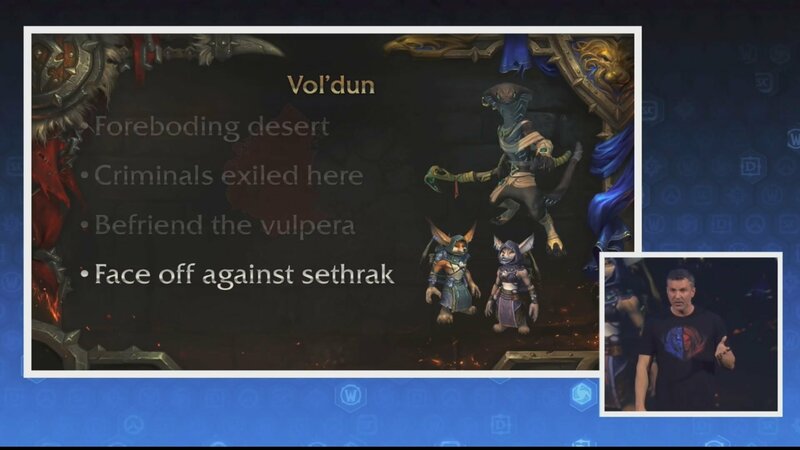 Last up, for Zandalar, we have got the desert of Vol’dun. Would you believe that Vol’dun was once a vibrant jungle? You would probably believe that. It is totally plausible. But all of that change when the Aquir — these mighty, savage of Old god minions attacked this region thousands of years ago, leaving nothing but desert and ruin in their wake. So what would the Zandalari do with an uninhabitable desert? Well, they use it to basically send off their criminals to; and most of them die. Most of them. Now as– (chuckles) yes, indeed. As– they are even cute in person… As we explore Vol’dun, we will come across a native race of fox people, and they are known as the Vulpera (who I know we will be compelled to help, because of just how cute and cuddly they are. Just want to eat them up); and Vol’dun has got its share of baddies as well, like this snake-men: the Sethrak — who will make sure that your stay here is unpleasant. Let’s take a look at a video of Vol’dun. That was Zandalar. Before I hand off to Ion, I want to take a minute to talk about character stories. In Legion, we did the character story for Illidan, and we really liked how that turned out across the patches — which by the way, it’s not quite done yet. You will get there pretty soon. 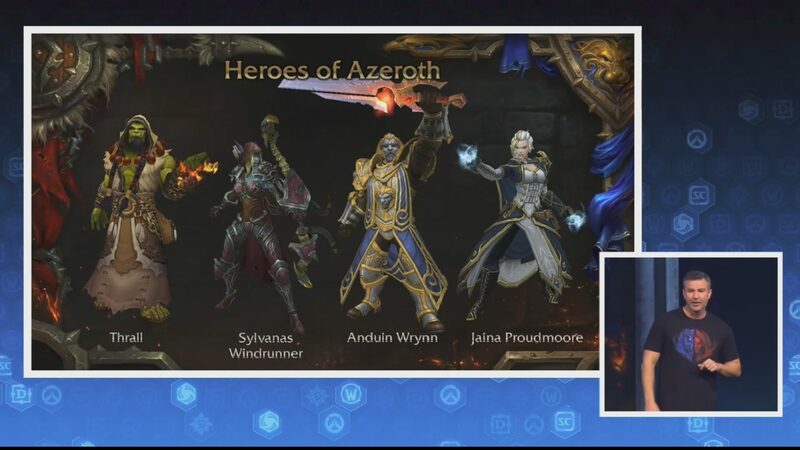 For Battle of Azeroth, we wanted to do a lot more of that. We wanted to evolve more characters. So we wanted to follow the lives of Anduin (the Lion of Stormwind), and Sylvanas — as they lead their people through this war; and of course, we are going to adventure with Jaina — as she goes to her homeland: Kul’Tiras. We will find out where she has been, because I know you are all asking. Where she is at today, and most importantly where she is going? What about Thrall? 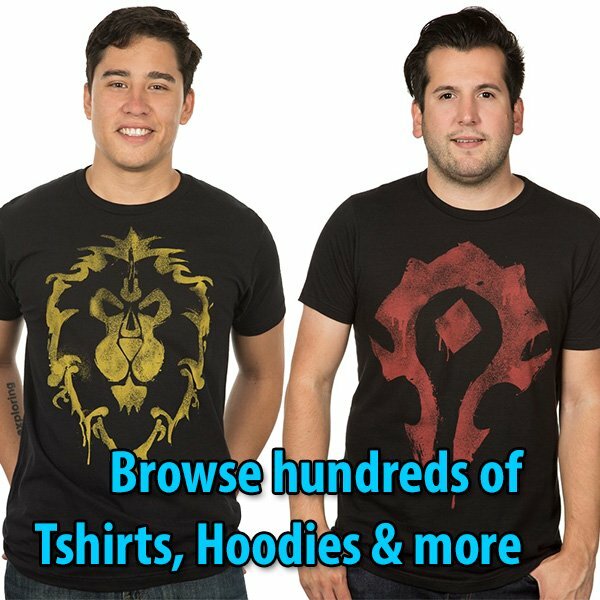 Where is the orc that founded this new Horde? What is his place in all of this? … and lastly, we are not going to go to the cradle of troll civilization without exploring the story of our favorite troll: Vol’jin. Thank you, everyone. You have been an amazing audience. Ion is up next.